A new initiative is being launched to help Shetland companies cash in on the islands’ booming cruise liner trade. With record numbers of vessels and passengers on the horizon for next year, Lerwick Port Authority (LPA) is holding a series of workshops aimed at helping firms from a range of sectors get involved. A general session on the cruise industry and the supply chain needed to support it will be followed by events focusing on areas including transport, product requirements and retailing. 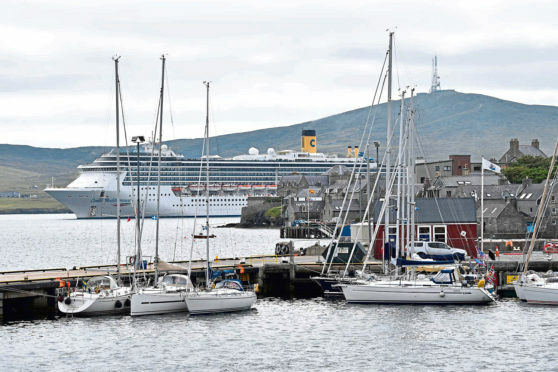 This year’s total of 91 liner visits to Shetland is on course to be surpassed in 2019, with 115 already booked and expected to take around 91,000 passengers to the islands. The workshops are being supported by development agency Highlands and Islands Enterprise (HIE), Shetland Islands Council and VisitScotland. The initiative was announced at a lunch held by LPA yesterday to thank existing supply chain members for their support during the 2018 liner season. Ms Laurenson, who retires next week, added: “The commitment of the wide-ranging supply chain in providing a warm welcome for thousands of passengers and responding to varied requirements is a key to the growing cruise traffic through the harbour.